The selections of Ulisses Soares and Gerrit W. Gong were announced at a conference of The Church of Jesus Christ of Latter-day Saints. SALT LAKE CITY — The Mormon church made history and injected diversity into a top leadership panel on Saturday by selecting the first-ever Latin-American apostle and the first-ever apostle of Asian ancestry. The selections of Ulisses Soares of Brazil and Gerrit W. Gong, a Chinese-American, were announced at the start of a twice-annual conference of The Church of Jesus Christ of Latter-day Saints. They join a panel called the Quorum of the Twelve Apostles that, before Saturday, was made up entirely of white men from the U.S. with the exception of one German, Dieter Uchtdorf. The all-male panel sits below church President Russell M. Nelson and his two counselors and helps set church policy and oversees the faith's business interests. 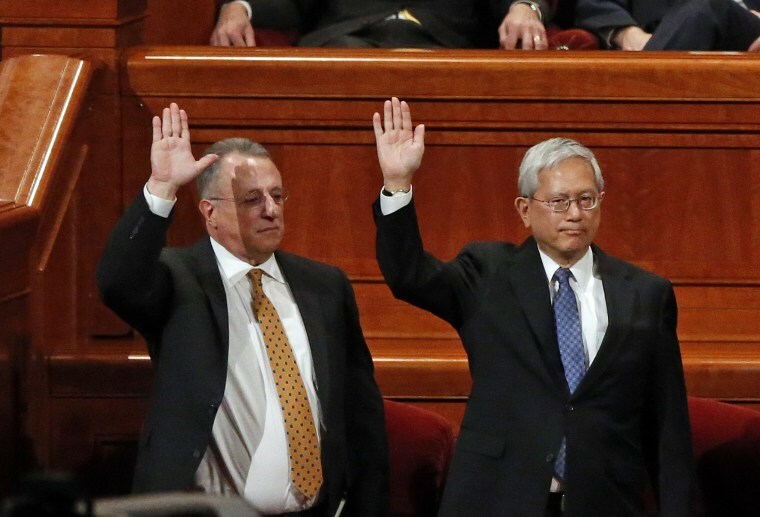 The selections of Soares and Gong are likely to trigger applause from a contingent of Mormons who were anxious to see the faith's global footprint represented in leadership. More than half of the religion's 16 million members live outside the United States. Their selections reflect the "rising focus of church leadership on the world outside the United States, where the church is growing most rapidly," said Mormon scholar Matthew Bowman, an associate professor of history at Henderson State University in Arkadelphia, Arkansas. With 1.4 million members, Brazil has the second-most in the world along with Mexico. Both rank behind the United States, which has about 6.6 million members. Like the previous 12 men chosen for the Quorum, Soares and Gong were serving in a lower-level leadership panel for the church. The 64-year-old Gong worked for the U.S. State Department, the Washington, D.C.-based Center for Strategic and International Studies and Mormon-owned Brigham Young University before being selected for the lower-tier church leadership panel. He was born in Redwood City, California. Their selections come during the first conference presided over by Nelson, a 93-year-old former heart surgeon who was appointed the 17th president in January following the death of president Thomas S. Monson, who served for a decade. The conference comes as the faith grapples with heightened scrutiny about its handling of sexual abuse reports and one-on-one interviews between local lay leaders and youth. The religion this week announced updated guidelines for the reporting of sexual abuse following news that a former prominent missionary leader was accused of sexually assaulting two women in the 1980s. The new guidelines call on lay leaders to never disregard a report of abuse or encourage a person to stay in an abusive home. They also say children can bring a parent or other adult to one-one-one interviews with local church leaders. Parents previously were allowed only in a hallway or adjacent room. Youth can still go alone if they choose. On Friday, about 1,000 Mormons and ex-Mormons marched to the church's Salt Lake City headquarters to deliver petitions demanding an end to the closed door, one-on-one meetings that start at age 12, along with the sexual questions they sometimes include. The statement also seemed to express a willingness to change: "As with any practice in the Church, we continually look for ways to improve and adjust by following the Savior in meeting the needs of our members." Nelson is expected to speak at this weekend's conference, but it's unknown if he'll address the issue or the larger topic of sexual misconduct that has been thrust into the national spotlight by the #MeToo movement. Church leaders usually focus their conference speeches on spiritual guidance and religious themes. The new Quorum members will join a quorum undergoing a substantial turnover following a string of deaths as previous leaders succumbed to the effects of aging. Five of the 12 panel members have been appointed in the past three years. Prior to 2015, it had been six years since a new quorum member was chosen, and more than a decade since the leadership council had two openings. Women aren't allowed on the religion's highest leadership councils or in the faith's lay clergy that lead local congregations. Church officials say their doctrine states men and women are equal, but only men are allowed in the lay priesthood because the religion follows the "pattern set by the Savior when it comes to priesthood ordination." A contingent of Mormons have advocated for years for a change in doctrine to allow women in the priesthood — including large rallies outside church conferences in 2013 and 2014 — but the Mormon church remains committed to its patriarchal structure. The nine highest-ranking women in the church oversee three organizations that run programs for women and girls. These councils sit below several layers of leadership groups reserved for men.